Define three types of outlines: working outline, full-sentence outline, and speaking outline. Identify the advantages of using notecards to present your speaking outline. When we discuss outlining, we are actually focusing on a series of outlines instead of a single one. Outlines are designed to evolve throughout your speech preparation process, so this section will discuss how you progress from a working outline to a full-sentence outline and, finally, a speaking outline. 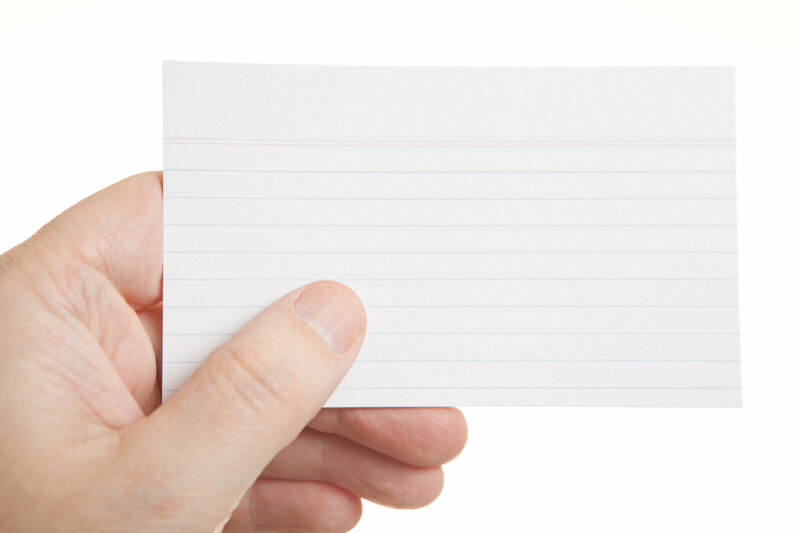 We will also discuss how using notecards for your speaking outline can be helpful to you as a speaker. A working outline is an outline you use for developing your speech. It undergoes many changes on its way to completion. 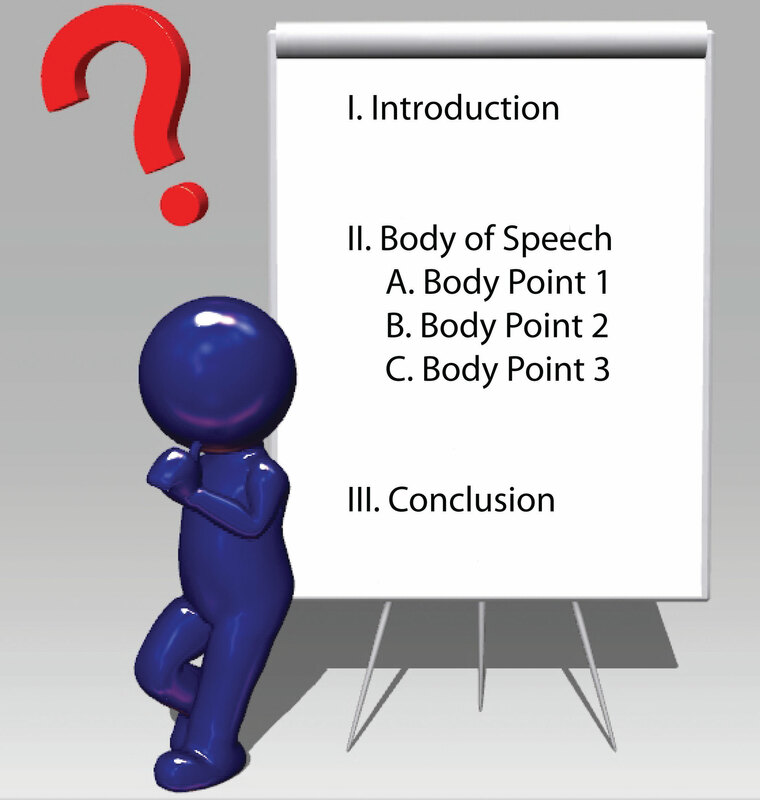 This is the outline where you lay out the basic structure of your speech. You must have a general and specific purpose; an introduction, including a grabber; and a concrete, specific thesis statement and preview. You also need three main points, a conclusion, and a list of references. One strategy for beginning your working outline is to begin by typing in your labels for each of the elements. Later you can fill in the content. When you look ahead to the full-sentence outline, you will notice that each of the three main points moves from the general to the particular. Specifically, each main point is a claim, followed by particular information that supports that claim so that the audience will perceive its validity. For example, for a speech about coal mining safety, your first main point might focus on the idea that coal mining is a hazardous occupation. You might begin by making a very general claim, such as “Coal mining is one of the most hazardous occupations in the United States,” and then become more specific by providing statistics, authoritative quotations, or examples to support your primary claim. A working outline allows you to work out the kinks in your message. For instance, let’s say you’ve made the claim that coal mining is a hazardous occupation but you cannot find authoritative evidence as support. Now you must reexamine that main point to assess its validity. You might have to change that main point in order to be able to support it. If you do so, however, you must make sure the new main point is a logical part of the thesis statement–three main points–conclusion sequence. Smart dust is an assembly of microcomputers. Smart dust could also have applications to daily life. (Thesis Statement) Thus far, researchers hypothesize that smart dust could be used for everything from tracking patients in hospitals to early warnings of natural disasters and defending against bioterrorism. (Preview) Today, I’m going to explain what smart dust is and the various applications smart dust has in the near future. To help us understand the small of it all, we will first examine what smart dust is and how it works. We will then examine some military applications of smart dust. And we will end by discussing some nonmilitary applications of smart dust. Main Point I: Dr. Kris Pister, a professor in the robotics lab at the University of California at Berkeley, originally conceived the idea of smart dust in 1998 as part of a project funded by the Defense Advanced Research Projects Agency (DARPA). Main Point II: Because smart dust was originally conceptualized under a grant from DARPA, military uses of smart dust have been widely theorized and examined. Main Point III: According to the smart dust project website, smart dust could quickly become a common part of our daily lives. This stage of preparation turns out to be a good place to go back and examine whether all the main points are directly related to the thesis statement and to each other. If so, your message has a strong potential for unity of focus. But if the relationship of one of the main points is weak, this is the time to strengthen it. It will be more difficult later for two reasons: first, the sheer amount of text on your pages will make the visual task more difficult, and second, it becomes increasingly difficult to change things in which you have a large investment in time and thought. You can see that this working outline can lay a strong foundation for the rest of your message. Its organization is visually apparent. Once you are confident in the internal unity of your basic message, you can begin filling in the supporting points in descending detail—that is, from the general (main points) to the particular (supporting points) and then to greater detail. The outline makes it visually apparent where information fits. You only need to assess your supporting points to be sure they’re authoritative and directly relevant to the main points they should support. Sometimes transitions seem troublesome, and that’s not surprising. We often omit them when we have informal conversations. Our conversation partners understand what we mean because of our gestures and vocal strategies. However, others might not understand what we mean, but think they do, and so we might never know whether they understood us. Even when we include transitions, we don’t generally identify them as transitions. In a speech, however, we need to use effective transitions as a gateway from one main point to the next. The listener needs to know when a speaker is moving from one main point to the next. In the next type of outline, the full-sentence outline, take a look at the transitions and see how they make the listener aware of the shifting focus to the next main point. Specific Purpose: To inform a group of science students about the potential of smart dust. Smart dust could be an enormous asset in covert military operations. (Thesis Statement) Thus far researchers hypothesized that smart dust could be used for everything from tracking patients in hospitals to early warnings of natural disasters and as a defense against bioterrorism. (Transition) To help us understand smart dust, we will begin by first examining what smart dust is. According to a 2001 article written by Bret Warneke, Matt Last, Brian Liebowitz, and Kris Pister titled “Smart Dust: Communicating with a Cubic-Millimeter Computer” published in Computer, Pister’s goal was to build a device that contained a built-in sensor, communication device, and a small computer that could be integrated into a cubic millimeter package. For comparison purposes, Doug Steel, in a 2005 white paper titled “Smart Dust” written for C. T. Bauer College of Business at the University of Houston, noted that a single grain of rice has a volume of five cubic millimeters. Each individual piece of dust, called a mote, would then have the ability to interact with other motes and supercomputers. (Transition) Now that we’ve examined what smart dust is, let’s switch gears and talk about some of the military applications for smart dust. According to the smart dust website, smart dust could eventually be used for “battlefield surveillance, treaty monitoring, transportation monitoring, scud hunting” and other clear military applications. Probably the number one benefit of smart dust in the military environment is its surveillance abilities. Major Scott Dickson, in a Blue Horizons paper written for the US Air Force Center for Strategy and Technology’s Air War College, sees smart dust as helping the military in battlespace awareness, homeland security, and weapons of mass destruction (WMD) identification. Furthermore, Major Dickson also believes it may be possible to create smart dust that has the ability to defeat communications jamming equipment created by foreign governments, which could help the US military not only communicate among itself, but could also increase communications with civilians in military combat zones. According to a 2010 article written by Jessica Griggs in new Scientist, one of the first benefits of smart dust could be an early defense warning for space storms and other debris that could be catastrophic. (Transition) Now that we’ve explored some of the military benefits of smart dust, let’s switch gears and see how smart dust may be able to have an impact on our daily lives. Everything from pasting smart dust particles to our finger tips to create a virtual computer keyboard to inventory control to product quality control have been discussed as possible applications for smart dust. Medically, according to the smart dust website, smart dust could help disabled individuals interface with computers. Theoretically, we could all be injected with smart dust, which relays information to our physicians and detects adverse changes to our body instantly. Smart dust could detect the microscopic formations of center cells or alert us when we’ve been infected by a bacterium or virus, which could speed up treatment and prolong all of our lives. (Transition) Today, we’ve explored what smart dust is, how smart dust could be utilized by the US military, and how smart dust could impact all of our lives in the near future. Crichton, M. (2002). Prey. New York, NY: Harper Collins. Griggs, J. (2010, February 6). Smart dust to provide solar early warning defense. New Scientist, 205(2746), 22. Kahn, J. M., Katz, R. H., & Pister, K. S. J. (2000). Emerging challenges: Mobile networking for “smart dust.” Journal of Communications and Networks, 2, 188–196. Vogelstein, F., Boyle, M., Lewis, P., Kirkpatrick, D., Lashinsky, A.,…Chen, C. (2004, February 23). 10 tech trends to bet on. Fortune, 149(4), 74–88. Warneke, B., Last, M., Liebowitz, B., & Pister, K. S. J. (2001). Smart dust: Communicating with a cubic millimeter computer. Computer, 31, 44–51. When you prepare your full-sentence outline carefully, it may take as much as 1 ½ hours to complete the first part of the outline from your name at the top through the introduction. When you’ve completed that part, take a break and do something else. When you return to the outline, you should be able to complete your draft in another 1 ½ hours. After that, you only need to do a detailed check for completeness, accuracy, relevance, balance, omitted words, and consistency. If you find errors, instead of being frustrated, be glad you can catch these errors before you’re standing up in front of your audience. 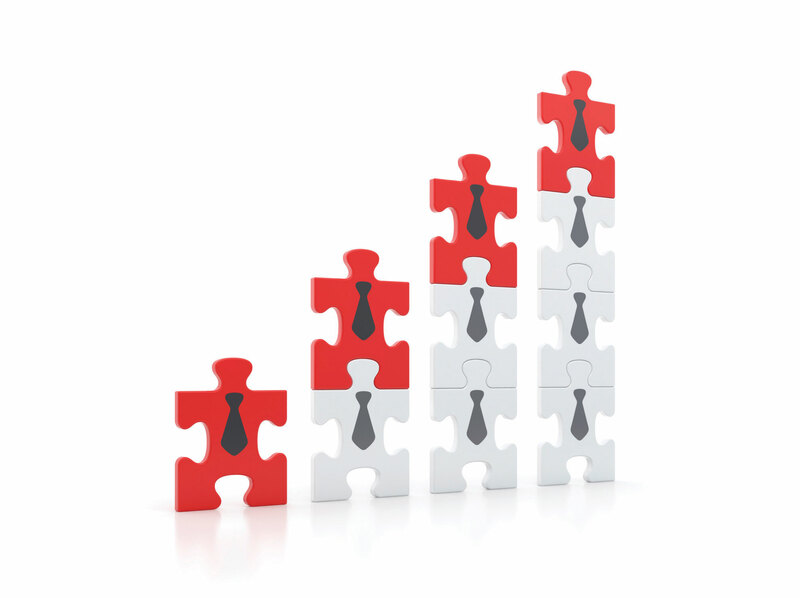 You will notice that the various parts of your speech, for instance, the transition and main points, are labeled. There are compelling reasons for these labels. First, as you develop your message, you will sometimes find it necessary to go back and look at your wording in another part of the outline. Your labels help you find particular passages easily. Second, the labels work as a checklist so that you can make sure you’ve included everything you intended to. Third, it helps you prepare your speaking outline. You’ll also notice the full references at the end of the outline. They match the citations within the outline. Sometimes while preparing a speech, a speaker finds it important to go back to an original source to be sure the message will be accurate. If you type in your references as you develop your speech rather than afterward, they will be a convenience to you if they are complete and accurate. Don’t think of the references as busywork or drudgery. Although they’re more time consuming than text, they are good practice for the more advanced academic work you will do in the immediate future. Your full-sentence outline prepares you to present a clear and well-organized message, but your speaking outline will include far less detail. Whenever possible, you will use key words and phrases, but in some instances, an extended quotation will need to be fully written on your speaking outline. Resist the temptation to use your full-sentence outline as your speaking outline. The temptation is real for at least two reasons. First, once you feel that you’ve carefully crafted every sequence of words in your speech, you might not want to sacrifice quality when you shift to vocal presentation. Second, if you feel anxiety about how well you will do in front of an audience, you may want to use your full-sentence outline as a “safety net.” In our experience, however, if you have your full-sentence outline with you, you will end up reading, rather than speaking, to your audience. The subject of reading to your audience will be taken up in Chapter 14 "Delivering the Speech" on speech delivery. For now, it is enough to know you shouldn’t read, but instead, use carefully prepared notecards. Your speech has five main components: introduction, main point one, main point two, main point three, and the conclusion. Therefore we strongly recommend the use of five notecards: one for each of those five components. There are extenuating circumstances that might call for additional cards, but begin with five cards only. How will five notecards suffice in helping you produce a complete, rich delivery? Why can’t you use the full-sentence outline you labored so hard to write? First, the presence of your full-sentence outline will make it appear that you don’t know the content of your speech. Second, the temptation to read the speech directly from the full-sentence outline is nearly overwhelming; even if you resist this temptation, you will find yourself struggling to remember the words on the page rather than speaking extemporaneously. Third, sheets of paper are noisier and more awkward than cards. Fourth, it’s easier to lose your place using the full outline. Finally, cards just look better. Carefully prepared cards, together with practice, will help you more than you might think. Plan to use five cards. Use 4 × 6 cards. The smaller 3 × 5 cards are too small to provide space for a visually organized set of notes. With five cards, you will have one card for the introduction, one card for each of the three main points, and one card for the conclusion. You should number your cards and write on one side only. Numbering is helpful if you happen to drop your cards, and writing on only one side means that the audience is not distracted by your handwritten notes and reminders to yourself while you are speaking. Each card should contain key words and key phrases but not full sentences. Some speeches will include direct or extended quotations from expert sources. Some of these quotations might be highly technical or difficult to memorize for other reasons, but they must be presented correctly. This is a circumstance in which you could include an extra card in the sequence of notecards. This is the one time you may read fully from a card. If your quotation is important and the exact wording is crucial, your audience will understand that. How will notecards be sufficient? When they are carefully written, your practice will reveal that they will work. If, during practice, you find that one of your cards doesn’t work well enough, you can rewrite that card. Using a set of carefully prepared, sparingly worded cards will help you resist the temptation to rely on overhead transparencies or PowerPoint slides to get you through the presentation. Although they will never provide the exact word sequence of your full-sentence outline, they should keep you organized during the speech. The “trick” to selecting the phrases and quotations for your cards is to identify the labels that will trigger a recall sequence. For instance, if the phrase “more science fact” brings to mind the connection to science fiction and the differences between the real developments and the fictive events of Crichton’s novel Prey, that phrase on your card will support you through a fairly extended part of your introduction. You must discover what works for you and then select those words that tend to jog your recall. Having identified what works, make a preliminary set of no more than five cards written on one side only, and practice with them. Revise and refine them as you would an outline. Introduction: 2002, Prey, swarm nanomachines feed on living tissue. Kahn, Katz, and Pister, U C Berkeley engineering and computer sci. profs. hyp. 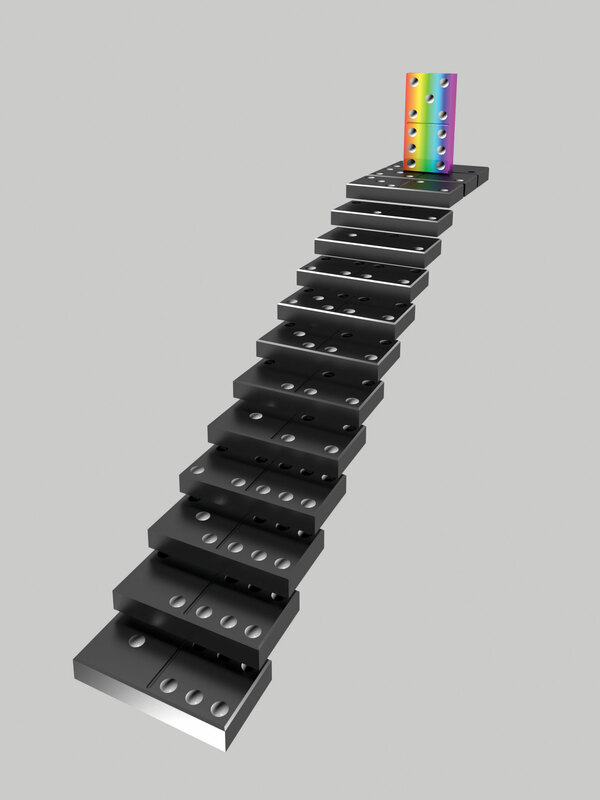 Microelectromechanical (MEMS) devices could detect light, temp, or vib. Thesis Statement: Researchers hyp that s.d. could track patients, warn of natural disaster, act as defense against bioterrorism. Prev. : What smart dust is and how it works, military aps, nonmilitary aps. Transition: To help understand, first, what smart dust is. I. Dr. Kris Pister, prof robotics lab UC Berkeley conceived the idea in 1998 in a proj. Defense Advanced Research Projects Agency (DARPA). 2001 article by Bret Warneke et al titled “Smart Dust: Communicating with a Cubic-Millimeter Computer” publ. in Computer, Pister wanted sensors, comm. devices, and computer in a cubic millimeter package. Doug Steel of CT Bauer College of Bus at Houston noted grain of rice = 5 cm. Each mote could interact w/ others. II. Orig conceptualized under DARPA, military uses theor. and examined. Smart Dust website, battlefield surveill., treaty monitor., transp. monitor., + scud hunting. Maj. Scott Dickson, Blue Horizons Paper for Ctr for Strat and Tech for USAF air war college, sees s.d. as help for battlespace awareness, homeland security, and WMD ID. could also defeat comm. jamming equipt by communicating among itself and w/ civilians in combat zones. 2010 article Jessica Griggs New Scientist, early defense, storms and debris. Transition: Switch gears to daily lives. III. s.d. project website: s.d. could become common in daily life. Pasting particles for virtual computer keyboard to inventory control poss. Medically, accdng to SD project website, help disabled. cancer cells, bacteria or virus, speed up treatment, and so on. Transition: We expl. What SD is, how SD cd be used military, and how SD cd impact our lives. Conclusion: Transf fiction to fact, experts agree potential 2025. Michael Crichton’s Prey isn’t reality, but in developing SD as fact, there are ethical considerations. Pister: privacy. Using a set of cards similar to this could help you get through an impressive set of specialized information. But what if you lose your place during a speech? With a set of cards, it will take less time to refind it than with a full-sentence outline. You will not be rustling sheets of paper, and because your cards are written on one side only, you can keep them in order without flipping them back and forth to check both sides. What if you go blank? Take a few seconds to recall what you’ve said and how it leads to your next points. There may be several seconds of silence in the middle of your speech, and it may seem like minutes to you, but you can regain your footing most easily with a small set of well-prepared cards. Under no circumstances should you ever attempt to put your entire speech on cards in little tiny writing. You will end up reading a sequence of words to your audience instead of telling them your message. Working outlines help you with speech logic, development, and planning. The full-sentence outline develops the full detail of the message. The speaking outline helps you stay organized in front of the audience without reading to them. Using notecards for your speaking outline helps with delivery and makes it easier to find information if you lose your place or draw a blank. With respect to your speech topic, what words need to be defined? Define what you mean by the terms you will use. How does your definition compare with those of experts?